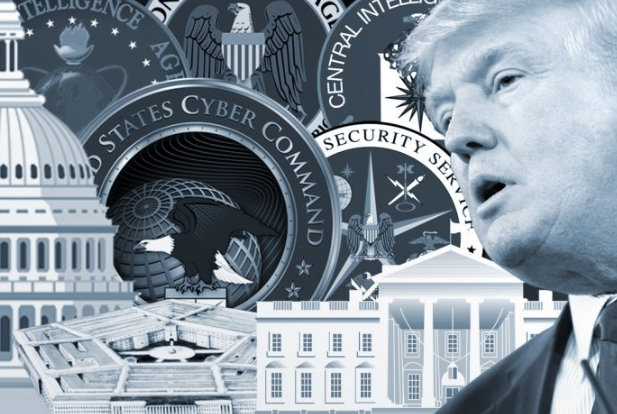 By John W. Whitehead: There are those who would have you believe that President Trump is an unwitting victim of the Deep State. And then there are those who insist that the Deep State is a figment of a conspiratorial mind. When in doubt, follow the money trail. It always points the way. Enter Donald Trump, the candidate who swore to drain the swamp in Washington DC. Instead of putting an end to the corruption, however, Trump has paved the way for lobbyists, corporations, the military industrial complex, and the rest of the Deep State (also referred to as “The 7th Floor Group”) to feast on the carcass of the dying American republic. Apart from tweets that are little more than sound and fury, Trump is not a man who is raging against the machine. He is too much a part of the machine. Despite claims to the contrary, Trump is not advocating for peace with Russia, or North Korea or any other nation. He is selling us out to the war hawks. The latest squawk over Iran is just more of the same chest-thumping, sleight-of-hand intended to play into the hands of a salivating military industrial complex for whom war is merely a means to a larger profit margin. The war hawks have no beef with Trump. Why should they? He’s giving them exactly what they want. This is exactly how you keep the Deep State in power. Domestic surveillance. The National Security Agency (NSA), with its $10.8 billion black ops annual budget, continues to spy on every person in the United States who uses a computer or phone. Global spying. The NSA’s massive surveillance network, a $500 billion “espionage empire,” is still spanning the globe and targeting every single person on the planet who uses a phone or a computer. Roving TSA searches. The American taxpayer is still getting ripped off by government agencies in the dubious name of national security. USA Patriot Act, NDAA. America’s so-called war on terror, which it has relentlessly pursued since 9/11, continues to chip away at our freedoms, unravel our Constitution and transform our nation into a battlefield, thanks in large part to such subversive legislation as the USA Patriot Act and National Defense Authorization Act. Militarized police state. Police forces continue to be transformed from peace officers into heavily armed extensions of the military, complete with jackboots, helmets, shields, batons, pepper-spray, stun guns, assault rifles, body armor, miniature tanks and weaponized drones. SWAT team raids. Nationwide, SWAT teams continue to be employed to address an astonishingly trivial array of criminal activity or mere community nuisances including angry dogs, domestic disputes, improper paperwork filed by an orchid farmer, and misdemeanor marijuana possession. Domestic drones. The domestic use of drones, now being equipped with weapons, able to record all activities, and use video feeds, heat sensors and radar, has continued unabated. School-to-prison pipeline. The paradigm of abject compliance to the state continues to be taught by example in the schools, through school lockdowns where police and drug-sniffing dogs enter the classroom, and zero tolerance policies that punish all offenses equally and result in young people being expelled for childish behavior. Overcriminalization. The government bureaucracy continues to churn out laws, statutes, codes and regulations that reinforce its powers and value systems and those of the police state and its corporate allies, rendering the rest of us petty criminals. Privatized Prisons. States continue to outsource prisons to private corporations, resulting in a cash cow whereby mega-corporations imprison Americans in private prisons in order to make a profit. Endless wars. America’s expanding military empire is continuing to bleed the country dry at a rate of more than $15 billion a month (or $20 million an hour). So let’s have no more of this caterwauling about Trump being victimized by the Deep State: he is doing too good a job at sowing division, creating distractions that keep Americans oblivious to the government’s ongoing power grabs, and helping to advance the profit-driven agenda of the Deep State.